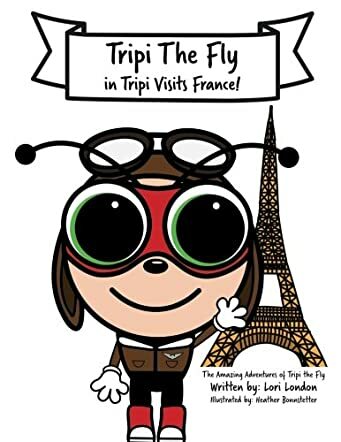 Tripi Visits France: The Amazing Adventures of Tripi The Fly by Lori London is a whimsical tale in which readers see Tripi the fly taking a transatlantic flight from Chicago to Paris. Tripi always longs for new adventures and he likes to see new sights, meet people, and go places. Tripi is different for a fly. He can read, talk, write, dance, and sing. Tripi reaches Paris and he is a French fly now. Tripi visits different places in Paris and tries out different types of food. Tripi had read about buses, boats, and trains in the Great Book and he takes a bus ride across the French countryside. The beauty of the South of France fascinates him and he sees grapes growing everywhere there. He takes a boat ride on the legendary Seine and makes friends with a poodle named Pierre. Let us read the book to find out about all the places Tripi visits in France and his adventures there. The story is exciting and adventurous and will encourage children to travel and discover new places. The book sheds light on the places of interest in France in a fun way. I loved the French-speaking poodle in Paris and the flying grapes in the South of France. The illustrations are as magical as Tripi’s adventures and make it captivating for readers. I like the author’s approach of introducing readers to the sights and sounds of Paris and France. It’s unique and different from the usual travel books children read. Tripi is planning to go to London next. Well, I can’t wait to accompany him and I am sure all young readers must be eager to go with him, just like me!